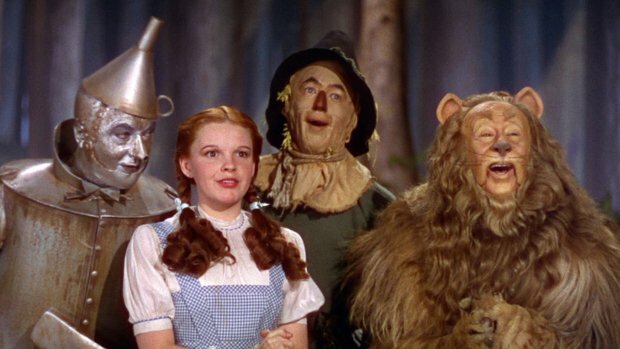 The Wizard of Oz is about a girl called Dorothy (Judy Garland) whose neighbour, Miss Gulch, threatens to take away her dog, Toto, but they run away. A hurricane hits the house and the house gets blown away. Suddenly the hurricane stops and she lands in Oz. She meets Glinda, the Good Witch of the North (Billie Burke) and all the Munchkins come out and start singing and thanking her. The Wicked Witch of the East (Margaret Hamilton) appears in a red puff of smoke, realises that her sister is dead and tries to get her ruby slippers, but the Good Witch of the North magically transports them to Dorothy's feet. She tells Dorothy to follow the yellow brick road to the Emerald City. She meets a lion who needs courage, a tin man who needs a heart and a scarecrow who needs a brain. They get to the Wizard of Oz and he tells them to get the witch's broom and they do by chucking water on her and she melts. They take the broomstick to the Wizard of Oz and they get what they want.